The Osprey is still being refurbished with hopes that one day she’ll be put back to sea! We heard from the teachers at Kent School that the Osprey is being refurbished in Wales and prepared for another journey. On the 5 February, it was brought outdoors so that we could see it was reporting again to the satellite. We are not sure how long its transmitter battery will last but it should provide several months of twice daily reports. On October 4th, we heard from Finland as follows: “HI, and firstly congratulations to the team on a successful project! Did you publish the boat’s information (what GPS, processor, construction) anywhere? I’m sure it’d be an inspiration to others trying the same or similar projects. In early September 2016, the Osprey appeared to be heading to Cork County Ireland. Since a few other mini-boats appear to be headed that way as well, our Irish colleagues were contacted about this approach. On September 25th, 2016, the Osprey appears to be headed for Wales. More than a dozen Welsh were contacted that evening when landfall looked to be less than 24 hours away. Many of these people were involved with the dramatic Carolina Dreamer story earlier in the year. On September 26th, 2016, as luck would have it, she safely landed on a stretch of sandy beach (51.64738N, -4.826775W). Word went out to the same folks emailed the day before and, within the first hour, we heard from Sarah Moore from BBC Wales. Later that evening, Raymond Ashworth posted on the Kent School Facebook page about a local news article in Wales showing pictures and the story of Robert Morgan finding it but he didn’t take it off the beach. We do not know who did! 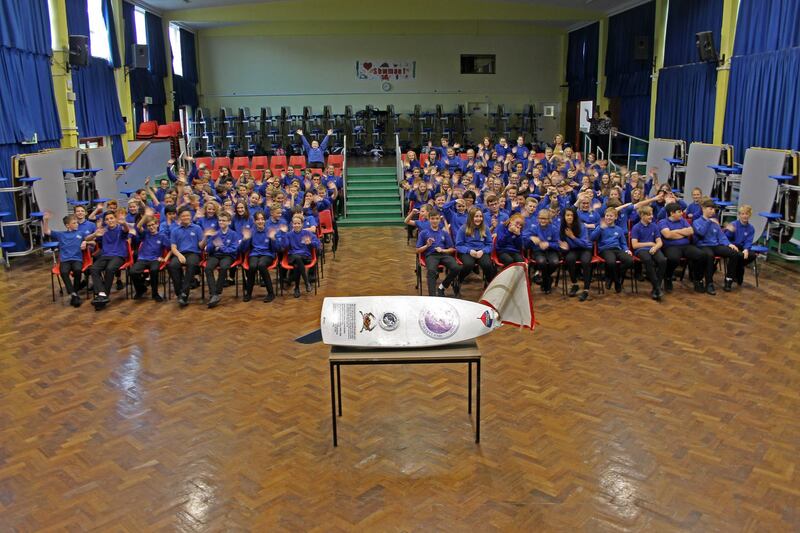 On September 29th, 2016 we found Ysgoi Greenhill School in Wales posted a photo of the assembly of Year 8 pupils in Wales as well as an article“. US school’s unmanned boat reaches Welsh coast. The Osprey (r) was one of three unmanned vessels launched in June from the US. 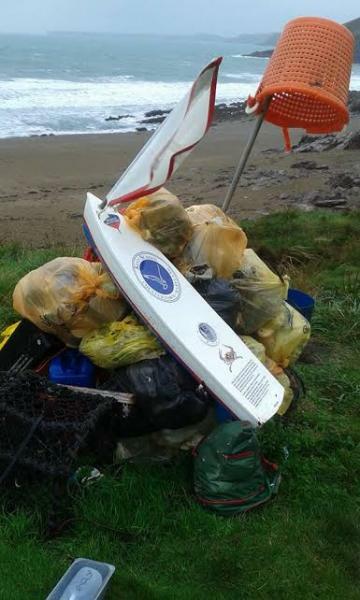 An unmanned boat sent by a school in the USA has washed up on the Pembrokeshire coast three months after it set sail. 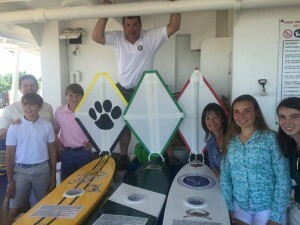 Students from Kent School in Maryland launched The Osprey with a time capsule onboard off the New Jersey coast on 13 June and tracked it across the ocean. Robert Morgan from Tenby found the boat in Swanlake bay, near Manorbier, while collecting rubbish from the beach. Kent School said they were “thrilled” the boat had reached Wales. The outside of the vessel contained a message in English and Spanish asking whoever found it to deliver it to the local “middle school” – or pupils aged 12-14 – who they said would find a list of email addresses and other items inside, and asking them to contact the school. In a message to BBC Wales, the school said: “We are thrilled that The Osprey made landfall in Pembrokshire. It was launched on June 13. 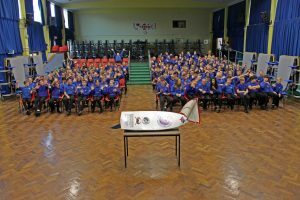 We look forward to interacting with students who may have a chance to view the contents of our time capsule.” Mr Morgan said he had been unable to remove the vessel from the beach himself as it was very heavy and he did not have transport, but he reported it on social media and it has now been taken to Greenhill Secondary School in Tenby. This miniboat, shown in photos below on the far right with a red sail and osprey picture on deck, is from Kent School in Chestertown, MD. Kent School’s miniboat was launched with two other miniboats from Easternshore, MD schools; Radcliffe Creek School (middle, green sail) and The County School (far left, yellow and black sail). MV Bermuda Islander launched the miniboats just east of the north wall of the Gulf Stream on June 14, 2016 during MV Bermuda Islander’s route from Salem, NJ to Bermuda. Liz Sparkey, a parent volunteer, and Trica Cammerzill, an administrator at Kent School are the leads on this project. 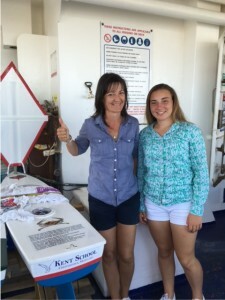 They were convinced to participate by Andrew Parish, a Delaware River Pilot, who was a huge part of organizing this collaboration between the Bermuda Islander, school students from Radcliffe Creek, The Country School (TCS) and Kent School, community leaders, NOAA, and Educational Passages. Now the race across the Atlantic is ON! The launch timing was intended to offer the teachers three months of data over the summer to view, create, incorporate the model tracking into the school curriculum for the upcoming school year. Besides ocean currents and weather effects on the models, there is always the hope of landfall, offering new connections with foreign students.